Tick’s are very common, they may infect humans with bacteria and viruses and cause health hazards. What repels ticks on humans is important to know for anyone who is into outdoor activities such as gardening, camping, hiking, etc. 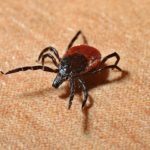 To get in contact with ticks is hard to avoid as they lure about everywhere in grasses, shrubs, around your yard or along trails, waiting for potential prey. There is no single measure to what repels ticks on humans best. There is also no single application that provides a one hundred percent reliable protection against tick bites. A combination of tick repellents and safety precautions as where ticks hide and how they live provides the best to prevent tick bite. Following a few simple rules can, however, reduce the risk of being bitten by ticks. The following list indicates measures before, during, and after outdoor activities. Some of these measures have together a risk-reducing effect only in combination and are ineffective if solely applied. 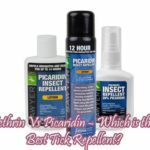 Apply a permethrin-based tick repellent onto your shoes and trousers as the ticks adhere mostly to lower legs or feet. When going outdoors, wear a light colored cloth with a full sleeve shirt. Pick a fabric that is woven closely so as to avoid the ticks hanging onto. Avoid moving through high grass or undergrowth if possible. Ticks feel here especially comfortable waiting for a potential host to bite. Soon after you come home from outdoors, inspect your clothes and search your entire body for ticks. Ticks need time crawling along your clothes and body until they find a suitable site for the bite. They prefer thin and warm skin. Search back of your knees, the stomach and chest area and crotch for ticks. In children head, hairline and neck are also affected. Take a shower as soon as you come home. 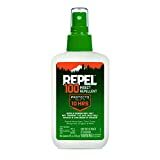 Among all the other repelling methods, using a DEET (chemical name is N, N-diethyl-meta-toluamide) based product has proven over the year and in millions of applications to be some of the most effective and best tick repellents. There are many repellents containing DEET as an active ingredient. They are available in different forms such as lotions, sprays, liquids, and roll on. The DEET products are designed in such a way that it can be applied directly to the skin or clothes. 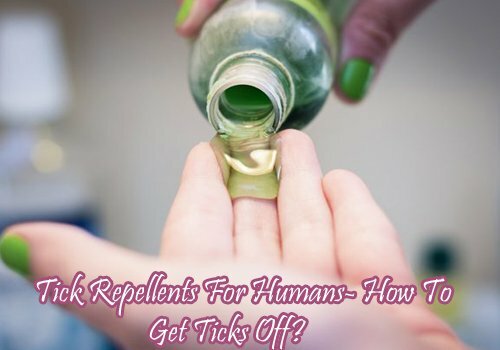 Being a true repellent, DEET does not kill ticks or biting insects. Instead, it conceals the human smell and irritates the bugs senses, keeping the ticks away from humans. As the DEET products are available for mosquitos and ticks, make sure you purchase the product specified for using on ticks. In addition to applying personal insect repellent directly onto the skin, it is effective to wear protective clothing including long-sleeved shirts, socks and long pants to keep away ticks. Treating your clothes with an anti-tick spray that contains the active ingredient Permethrin helps in killing ticks and other bloodsuckers instead of just masking the human smell. 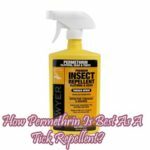 Permethrin may also be applied to the skin but is meant to be applied to your clothes. When sprayed onto clothing the permethrin dries off within 30 seconds and gets absorbed into the fabric, thereby keeping ticks away from you. Properly treated clothing has a long-lasting protective effect. Permethrin-treated clothing can be readily purchased. 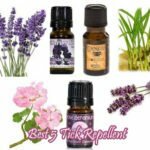 Natural tick repellents are mostly made using essential oils. They are considered to be safer regarding unwanted side effects than the other two repellents as they are herbal. However, they are not effective as the chemical methods. Also, the natural repellents require being applied frequently to repel effectively. They work only on the areas treated with the sprays and not on the entire body. Important to note is that some people are sensitive to certain essential oils and oils can cause allergies – especially in connection with the sunlight. If an oil causes a rash, reddens the skin or feels uncomfortable, another oil must be used. Please consult with your physician before use of essential oils or insect repellents. Use only as directed!